Elegant ocean side, ocean view townhouse on quiet ocean front street walking distance to town and fine or casual dining or shopping. This is one of the most desirable locations on the island and the beaches are very clean and private. It is a fantastic place that is built on an ocean front lot yet has two duplexes built in front of it (so it is not ocean front...but as close as you can get and definitely the next best thing!!). Next to us is the beach emergency access for the fire department so that is what gives us the spectacular ocean views. This area can never be built on and we sit on our deck and enjoy the surf. You can actually see the waves from the living area, and from the kitchen while eating or cooking. You can even see the sun rise over the ocean while lying in the comfortable Simmons world class beauty rest mattress! Not only is it furnished for supreme comfort it is decorated to make you feel completely at ease and relaxed from the moment you walk in. We made this our home away from home and it is decorated that way. The high top resin deck chairs make sitting on the deck like sitting on a thrown. The view is breath taking. The property also is walking distance to town and sits on a private and secluded residential section of surf city. There are no other town houses around - just single family homes and it is a 25 mph road for only beach front homes so it is quiet and relaxing. The town house has its own private parking and beach access (no streets to cross of course because you are on an ocean front lot already). You just couldn't have a better location. This home was newly renovated. The living area furniture has been upgraded to all leather reclining sofa July 2017.. It is tastefully decorated and features quality fixtures and flooring. There is a well appointed kitchen and comfortable furniture throughout the home. Because we know a good vacation can only be good if you can get a good nights sleep, we feature premium bedding with Simmons World Class Beautyrest mattress on the King Size master bed and also on the two full size beds in the second bedroom. The upper bunk twin beds is a quality Serta mattresses. The home is equipped with comfort height 18 toilets and custom lighting. Bed linens are included at no extra charge (many units would charge you an additional fee of approx ~$25 per bed for this) [note that the mattresses are very thick and would require deep pocket sheets if you choose to bring your own]. Departure cleaning is also included (many units charge you an additional $90 for this). PLEASE NOTE THAT BATH AND BEACH TOWELS ARE NOT PROVIDED. . The home has WiFi (wireless internet), 60' LCD HD TV with Blue Ray DVD, and premium sound system. Bedrooms also have cable LCD Flat screen TVs. Sleeping accommodations are one king, one twin over full bunk, and one full. Topsail is a great place for families and fun. Enjoy quiet relaxation of the ocean breeze and watching the surf from the comfy high top resin deck chairs or a moonlight walk on the beach. The home has a private access to the beach directly in front of your door. This access is for town homes only. Enjoy watching the children play on the beach right from your deck or fish off the beaches right in front of the town house. You can also walk up to the Surf City Pier to see what's biting. Enjoy walking for literally miles on clean white beaches looking for prehistoric sharks teeth (Topsail is one of the few area on the east coast where they are easily found) or gather shells or 'sea beans' (small polished pebbles) for you collection. Visit the famous Sea Turtle Hospital here on the Island (see link on other page) or stop at one of our local shops and pick up some fresh home made fudge, pies or or seafood. Have a larger family or not finding the weeks you want? Ask about our other town house units listed on VRBO at numbers 467705 and 626041, as well as our ocean front homes at number 1201949 and 1365373. We purchased this home in August of 2011 as a place to come and get away for a little sun sand and relaxation. We have been coming to Topsail for 30 years and our three children have grown up enjoying the beaches and looking for sharks teeth in the sands of Surf City. We used to travel here from the Philadelphia area because the beaches were so clean and private. We've always felt it was worth the trip and met many who traveled much further than us. Topsail is a wonderful family place but it is also a place where fishermen and surfers can share the beach and enjoy the long season of warm crystal clear water. In the fall we would stay out all night and wait on the beach with our children for the turtle nests to hatch. Vacationing in Topsail has always been worth the trip. After 30 years we finally bought something. This property represents a home away from home for us and I know you will find it warm, and inviting too. This property represents a home away from home for us and I know you will find it warm and inviting too. Since we already know Topsail will charm you, we want the home to charm you too! We made a real effort to renovate this vacation home and its bedding and furnishing so that you will definitely want to return! You will find our homes stand out from the crowd by the attention to your comfort and enjoyment. From our reviews, we think we hit the mark! We love that we can walk to the beach front restaurants and the fishing pier. We also love that we have a great view of the ocean from our deck sitting in the high top chairs. It is really nice to have a private beach access and not to have to cross the street to get to the beach. It really feels like beach / ocean front without ocean front prices and that makes it very affordable for people to get a high quality rental in a fantastic location. This ocean side town home has private beach access and deck.... no need to cross streets! Spectacular ocean views from your living area, master bedroom and deck. This home is considered "Ocean Front B" meaning it sits on an ocean front lot with a duplex in front of it. Bed Linens are provided at no additional charge. Bath towels, beach towels and hand towels are NOT provided!! You will find this kitchen well stocked with everythin you need from wine openers to hand towels... a very classy place! I believe this is our best VRBO experience yet!! The layout was perfect for our family of three little boys and the ocean view from the open concept living room/kitchen/dining space was a nice surprise since the condo is 2nd row. It was super short to walk out the door right to the beach...making quick trips for bathroom breaks and snacks easy. There was a lot of post-hurricane construction and beach rehab during our stay...with few rentals even available. We loved the location. We walked to dinner twice and lunch once. If it hadn’t rained we probably would have walked every day. We highly recommend this rental and can’t wait to stay there again. The owners are simply amazing people and we loved our stay here in their property during a military move while we searched for permanent housing. The place was amazing , comfortable and gave us time to take our minds off a stressful military move . We will recommend their properties to everyone we know and hope to come back this summer and stay here again! It was perfect! Clean, comfortable, exactly as advertised. No street to cross to beach. 7 year old boy and puppy LOVED IT!! The home was absolutely beautiful. We were not disappointed in any way. We are already planning on renting from him next year on one of his larger properties so we can bring more friends and family to share the experiences we had while at Surf City. Mr. Waltz was incredible to work with. He was literally just a phone call away. We thoroughly enjoyed our stay at Ted's place. He was prompt in replying to emails, call's and text's. 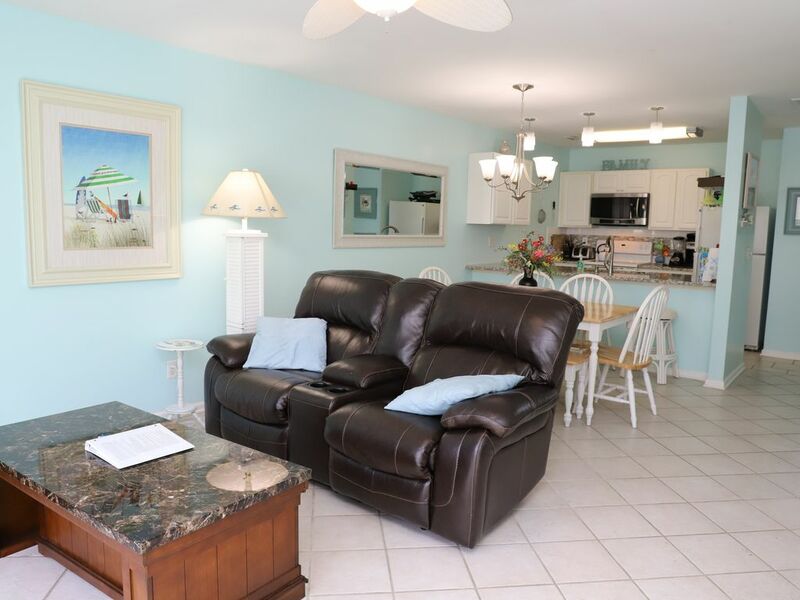 The place is close to the beach and walking distance to town. We highly recommend eating at Daddy Mac's Beach Grille. Superb service and food. This property INCLUDES, departure cleaning, and INCLUDES bed linens making your vacation dollar go farther! Pet fees are per pet. Please note that this property is subject to $300 fine and eviction for having undeclared pet. This is a non-smoking property.